Such is the impulse of the revolutionary impulse: in its aftermath come the countering forces that either absorb the reform or repulse it with fanaticism. In response to the student revolt of May came the triumph of General De Gaulle’s rightist party. In Latin America, the spirit of Che Guevara was repulsed by authoritarian military regimes with Washington’s backing. In Prague, socialism with a human face, as it came to be termed by the Slovak Alexander Dubček, bore witness to the monstrosity of Soviet tanks supposedly sent to put down counter-revolutionary tendencies. The converse was true. Again, Czechoslovakia found itself at the mercy of real estate holders that did not own them, but felt free to dispose of them. Neville Chamberlain’s ghost, grasping the worthless paper that was the Munich Agreement of 1938, seemed to be riding again. In a terrifying historical redux, the territory so vital to various currents in European history found itself engulfed in another intervention, an experiment of power and punishment. Subsequent scholarship on the motivations for the invasion has not shifted much. Big picture politics can be given a retrospective fit of grand sophistication and foresight. Often, short sighted fear remains the great motivator. The decision to invade, surmised Kieran Williams in a review of emerging Russian literature in 2012, “was a civilian, political decision driven by concern for the survival of the Communist Party in Czechoslovakia and for that country’s attachment to the Soviet bloc, lest it involve into yet another maverick such as Yugoslavia, Albania and Romania.” A nagging interpretation – that the Soviet Union wanted to militarise a state it had formally withdrawn its forces from in 1945 as part of a geopolitical ploy, persists but remains speculative. Then came a period of forgetting, or at least the regime-controlled amnesia of normalisation. New layers of checks and audits were imposed at the workplace; employees were harassed and laid-off; controls on the press and free speech re-tightened. But the memories started re-awakening in the sparks of Charter 77, the tunes of The Plastic People of the Universe, and the thaw that would end the Cold War, the Velvet Revolution being the natural successor to the Prague Spring. 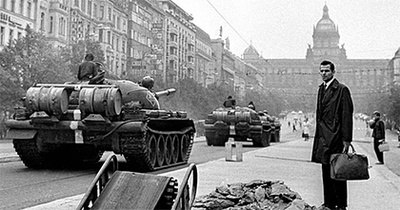 Five decades on from the invasion finds the Czech Republic troubled. Democratic stubbornness finds itself in an uneasy tease with ethnonationalism. The tensions posed by anti-EU sentiment across several central and eastern European states, dressed up as the muscular assertions of independence, afflict the continent. A fear of Russia eats away, as do concerns about irregular arrivals. But even within the Czech Republic, all is not uniform. The Czech Republic’s President Miloš Zeman finds more comfort glancing east to broody Moscow and rising Beijing than west to the working firm of Brussels. Robert Malecký of the E15 daily was beside himself at this fact, suggesting that Zeman’s snub was tantamount to handing the podium to the Slovaks to speak on behalf of both nations. Fifty years on, the potency and poignancy of the event remain, though it faces a new struggle against forgetting. The blood has long dried; a good number of the current generation see little contemporary relevance in the heroism of those who perished before the tanks of the Warsaw Pact. The political classes disagree: be wary of external forces, goes this message. Be ever warier of betrayal.